A loaded question for sure, but it's one that needs to be addressed, argue frustrated providers. For health care providers, there's no denying the impact of denials. Most providers devote a tremendous amount of resources toward addressing and responding to payer denials. Meanwhile, opportunistic payers attempt to identify coding shortcomings and shoddy medical record documentation—occasionally going beyond the law in their attempts to recoup payments. Therefore, providers must be prepared to research and appeal denials whenever possible. Day Egusquiza, president of AR Systems, recently wrote in her monthly newsletter about a problem impacting many providers: denied claims without much explanation. She cited a six-hospital health system in upstate New York that had a payer/Medicare Advantage plan send a 1,200-record request for a risk validation audit, followed three months later by a second request for 200 additional records. When discussed with contracting, it was learned there is a provision that allows for 10 records per site per request, so the most the payer/Medicare Advantage plan could have asked for was 60 records. This sort of denial "abuse" is an issue she, like many in the industry, believes needs to be addressed. Andrew Wachler, JD, principal of Wachler & Associates, P.C., says it's common for claims to fall short of Medicare or third-party requirements, but sometimes compliance with the billing rules is in the eye of the beholder. "Part of the problem is, yes, there is a problem out there, and if we don't have some of these contractors reviewing claims, the problem could be even more exacerbated," he says. "There's another way to look at it, too, and I don't think they're mutually exclusive. Some of these contractors are on a percentage; others feel like they have to deny a lot of claims to get their contracts extended." Wachler believes some contractors view documentation at a level that is either impossible or challenging to meet on a regular basis and favor denying claims. Some become overzealous and incentivized to deny claims, he says. "And so we're often caught with a dilemma where a contractor may be saying these claims don't meet the documentation requirements," Wachler says. "I can take those claims to a billing or coding expert or a medical expert for medical necessity and they say it's absolutely appropriate. Then you have to appeal it with a long appeals process and eventually win, but it's hard to advise a client to change their behavior when we think the reviewing body is wrong in their denial." Joanne Brockman, RHIA, CCS, vice president of consulting services for LexiCode, says if providers can submit evidence that the initial claim billing was correct, the denial can be overturned. "Having a knowledgeable denials management team devoted to researching and appealing where appropriate is recommended," she says. "The team should include all subject matter experts, ie, clinical, coding, and billing." The best practice for managing denials, however, is to prevent them in the first place. To accomplish this, Brockman suggests providers establish a robust workflow process to not just respond to denials but also analyze the root causes of denials and use this information to educate where needed to prevent errors from occurring. "Often, denials can be narrowed down to a few very specific issues; education at the front end may result in significant improvement, even in the short term," she says. "The best way to challenge is to have informed, knowledgeable staff that can research and respond to payers if they feel the denial is inappropriate or inaccurate." Christy Matheson, RHIA, CCS, vice president of coding at Medical Record Associates (MRA), says some statistics indicate that 3% to 6% of net patient revenue is being lost due to denials. She believes clinical denials have been increasing—especially those involving sepsis. "It's pretty obvious sometimes with some of these companies auditing that their main objective is to deny payment of the DRG [diagnosis-related group] no matter the documentation—either they pick up on some minor documentation in the record, really reach for the interpretation of Coding Clinic or coding guideline, or create their own reasoning for denying a code," she says. "I've also found the reviewer just missed the supporting documentation completely or wasn't aware of a coding guideline/Coding Clinic reference." Cathie Wilde, RHIA, CCS, director of coding services at MRA, says strong documentation that supports coding is the key to preventing denials. "To try to combat denials and move from more of a reactionary mode to prevention mode, health care organizations can implement processes and industry best practices," she says. "It's essential to provide routine and targeted education for physicians and coders." Wilde recommends providers conduct routine, regular internal coding audits; establish key performance indicators to monitor coders; address coding accuracy and other issues by coder, physician, and service line; and maintain an ongoing clinical documentation improvement program. For denial reviews, Matheson says to examine code changes and denials by payer, coder, physician, and service line, track all claim denial rates by category, perform deep data analysis on denial categories, and search for root causes. She says it's vital to maintain a payer audit tracking system to trend results by several categories, including DRG, CPT code, ICD-10-CM code, and physician. The system should have the ability to triangulate and compare coding audit results, denial data, and payer audit trends to reveal targeted areas for improvement. "Health care organizations should develop an organized denial prevention strategy," Matheson says. "This creates a culture of accountability." Adrian E. Velasquez, president of Fi-Med Management, says there are many variables and opportunities to address clean claim errors from demographics, payer information, ICD-10 diagnosis selection for specificity, and procedure codes, making it important to be organized with ideas and data with specific examples. To illustrate the prevalence of the problem, Velasquez cites a case study involving a California radiology group that provides services to five hospitals. The group has 28 radiologists, 121 payers as well as Northern and Southern California Medicare, with $95 being the average charge. The first quarter of 2018 featured 72 denial categories with a total of 18,733 denials amounting to nearly $1.8 million in charges. "In this case study, the denial rate is 15.61%, with a loss of $500,000 if not corrected," Velasquez says. "FTE time for researching, correcting the claim, resubmitting to the payer, electronic or paper resubmission costs, and electronic remittance advice and payment posting costs [is] a major expense, too. If the reimbursement is not high enough, you lose money on each transaction." He says health care organizations must identify denials and implement an "up-front" strategy to eliminate the problem, with an accountable, proactive revenue cycle management action that reduces costs and improves cash flow. Matheson mentions a case involving a patient with hypernatremia (E87.0) that was clearly documented throughout the medical record with the physician specifically stating it was being treated with IV fluids and levels were being monitored. The documentation clearly met Section III Reporting Additional Diagnoses criteria. "The code was being denied because 'the clinical evidence in the medical record does not support the assignment of E87.0,' stating that, 'though a sodium level of 145 to 149 may be reported as high on a laboratory report, a sodium level greater than or equal to 150 denotes clinically significant hypernatremia.' [The auditor] cited references for what is considered 'clinically significant' hypernatremia. The WNL [within normal limits] range for hospital laboratory was 135 to 145 and this patient's level was 147." Judy Sturgeon, CCS, CCDS, clinical coding/reimbursement compliance manager at Harris Health System in Houston and a contributing editor at For The Record, says auditors often approach acute kidney injury (AKI) much the same as they do hypernatremia. "One managed care organization likes to delete the code for AKI if the creatinine isn't really high instead of looking at the comparison of baseline, current percentage of increase, and subsequent return to baseline," she says. "A clinician's concept of 'clinically significant' doesn't affect code assignment. The auditor needs to use the coding definition of what comprises clinical significance, and that's clearly documented in every update of Official Coding Guidelines." A Target on Their Backs? Although no one on the payer side would ever admit it, some organizations are more likely to get denials than others. Wilde uses a fishing analogy to describe payer strategy: They throw out a line and if they get a nibble or catch a fish, they keep fishing in that spot. "So, if they find an area that is exposed at an organization, they will continue digging deeper to look for other areas or opportunities," she says. "I think any organization is at risk. You can make a case for a bigger target with large complex institutions or small rural community hospitals, but at the end of the day, regardless of the size of the organization, they should be taking proactive measures to ensure they have accurate coding and billing practices, which are substantiated by the medical record documentation." With many departments capturing their own charges, acute care hospitals are frequently targeted by payers, Brockman says. "It can be very challenging to achieve change or roll out education to correct incorrect billing practices when large numbers of individuals must be educated," she says. "From a clinical perspective, acute care facilities have historically been vulnerable in the inpatient environment to medical necessity denials, in addition to coding denials." One advantage for acute care facilities is they typically have the benefit of the necessary resources to create a robust denials management strategy. Conversely, smaller facilities and physician practices are more vulnerable to denials, as they may not have the knowledge, expertise, or technology to understand how to address and resolve denials. Wachler has seen a lot of recent activity at home health agencies, an area where he feels contractors can be overzealous in pursuing denials. Durable medical equipment supplier providers have also been hit hard over the years, he notes. "Certainly from 2010 to 2014, the hospitals were absolutely overwhelmed by recovery audit contractor [RAC] denials, inpatient … and we see a focus on certain types of providers and certain types of issues, but home health has gotten hit pretty hard consistently," Wachler says. In California, claim denials have been particularly irksome. Much of the frustration stems from the fact that, as of mid-July, Medi-Cal has not updated its claims adjudication system to accept 2018 codes. "The clearinghouse has claim scrubbers that will not accept 2017 codes. So if we submit 2017 codes per the Medi-Cal requirements, those claims will be denied at the clearinghouse," Velasquez says. "Therefore, we have to use 2017 codes for Medi-Cal only and print the claims to paper, fold, stuff, and apply postage and mail those claims. A very costly process." Nationwide, Wachler says the appeals process is clogged. However, he notes that the Office of Medicare Hearing and Appeals has received a substantial budget increase, allowing it to add judges and hopefully reduce the backlog. "Also, over the past several years, there's been some substantial reforms that have been implemented that allow certain settlement processes that were never available before," Wachler says. "Both are key factors in reducing the backlog that I think are important." Velasquez says should a provider believe that a contractor is not obeying the rules, it's OK to contact the Centers for Medicare & Medicaid Services (CMS) about a potential violation. In fact, he's all for going outside established rules to solve problems. "So, yes, if a contractor is doing something in violation of the rules, we call CMS and try to get them to fix it, and they are usually very responsive," he says. While Fi-Med Management has never turned a payer in to CMS, it has contacted a member of the House of Representatives to take action, noting that the strategy proved effective for Medicare and commercial payers. Wilde says organizations that focus on proactive compliance with documentation and coding practices are more likely to avoid auditor scrutiny, possible denials, and financial penalties down the road. "Stay abreast of what is happening in the industry and know what the hot audit trends are that payers are focusing on," she notes. 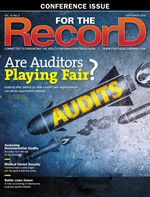 "Monitor RACs, Medicare Administrative Contractors, and other payer websites. "Don't take no for an answer. Take the time and devote the internal resources to denial review and working through the appeals process," she continues. "Appeal every denial for which the coding is correct, citing specific documentation in the record and coding guideline and Coding Clinic references to support your position. Be sure to address each component of the denial specifically." During the appeals process, it's difficult to come to a consensus or compromise because the volume of claims almost precludes that type of discussion and is beyond the scope of authority of most of the people involved in the hearing, Wachler says. Nevertheless, there are strategies that can lead to success, he notes. "It's basically a three-step appeal process," Wachler says. "And we focus on the first two levels now because there's a three-year wait between the second level of reconsideration and the hearing before the administrative law judge." From a compliance perspective, coding is key, according to Wachler, who recommends leaning heavily on resources such as CPT Assistant, a monthly publication from the American Medical Association. For diagnosis and inpatient coding claims, there are the Official Coding Guidelines for ICD-10-CM and PCS, and the American Hospital Association's publications of Coding Clinic for ICD-10-CM/PCS. These official coding publications allow providers to better support the original coding, Wachler says. Local coverage determinations [LCDs] may instruct on what's an acceptable diagnosis code based on the reasoning being used to submit the bill. For example, the LCD may instruct that if it's an invasive procedure, the provider will need to document that the patient has had three months of conservative treatment. In this way, the LCD can tell you the medical indications and the documentation requirements, he says. "We don't want to appeal without making sure that we do something to improve the documentation and enhance the accuracy of the coding and incorporate those compliance measures going forward on a prospective basis," Wachler says.